Tourist destinations of the state of Quintana Roo, such as Isla Mujeres, Cozumel and the Riviera Maya continue to obtain distinctions from specialized magazines that classify them as some of the best places to practice scuba diving worldwide. These destinations were graded by more than 5,000 divers who participated in the voting to choose the most beautiful tourist destinations to dive around the world. The well-known and specialized magazine Scuba Diving Mag, in the 2019 edition of the Readers Choice Awards 2019 placed Isla Mujeres as the winner of the Best Diving Destination award in the Large Animals category; the Riviera Maya and Cozumel in the Cave Diving category, as well as in the Advanced Diving category. The results that were published in the magazine Scuba Diving Mag, and it is the second consecutive year in which Quintana Roo receives such recognition. Governor Carlos Joaquín stressed that Quintana Roo is one of the richest states of the Mexican Republic in natural beauty. “We have a strategic location with good weather, ocean, fresh water, jungle, beaches, enviable natural resources that have allowed us to continue distinguishing ourselves as the favorite destination of Mexico and the Caribbean,” the governor said. He recalled that since his administration began, public policies have been reoriented so that more investment, and more tourism, continue to arrive. “This, he added, consolidates us as a regional tourism power, which allows us to grow the economy in order to provide services to a population that grows rapidly, at a rate of 30% per year, so that they have more and greater opportunities for a better lifestyle”. Darío Flota Ocampo, president of the Tourism Promotion Council of the state, said that Quintana Roo has received 15 international awards and recognitions. For his part, the president of the National Chamber of Commerce, Services and Tourism in the Northern Zone, Rafael Ortega Ramírez, said that the results of the policies implemented in the current administration are visible. In this sense, he cited as an example the fact that in the past long weekend the occupation of the hotels in downtown Cancun increased by 7%. “The reactivation of economic activity in the downtown area of ​​Cancún allows a positive forecast for the up coming holiday seasons,” he added. 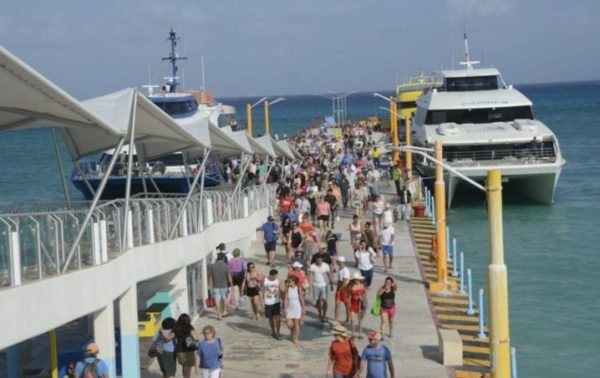 In turn, Iván Ferrat Mancera, president of Asociados Náuticos de Quintana Roo, said that the natural atractions of the state continue to attract more visitors.